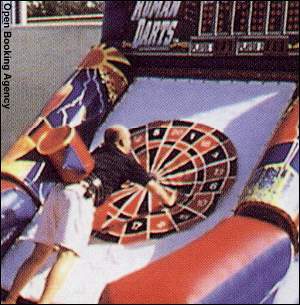 Strap into a human dart suit and become a dart! Ready, aim - fly onto a 5 foot velcro dart board. 4 colors, 4 teams. Add up the high score, or assign a target score to each team and the closest wins! Many different games available - Human cricket, 301 and more! Hit a bullseye at your event!